Apple says 30-pin dock adapter for iPhone 5 and new iPods has a DAC | What Hi-Fi? UPDATE: The UK Apple Store has now gone live with details of the new iPhone 5, new iPods and the Lightning-to-30-pin-dock connector adapter. The page for the adapter (above) confirms that it does support 'analog audio output and USB audio', but not video output, and we have been informed it does have a DAC inside. The adapter will be available from next month. POSTED 20:00 13.09.12: According to our colleagues on Stuff magazine, Apple has confirmed that the Lightning adapter does have a DAC built-in. They say: 'Stuff has just had a chat with Apple about the steep price of that Lightning connector and it’s been revealed to us why. 'As you may have noticed the Lightning port is purely digital, but the old 30-pin connection in your car or on your speaker dock uses an analogue signal. So it should work with existing docks that take an analogue connection, though it might now scupper docks and other devices that previously took a digital connection and used their own DACs. Video out still won't work and the 'iPod Out' connection, which works with some in-car audio systems to show an in-car iPod display, won't work with the new adapter. Apple announced a new Lightning connection for the iPhone 5 and new iPod touch and iPod nano, and it seems even with a £25 adapter, it may not play music through your existing kit. 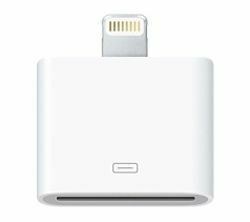 Speaker docks, some in-car connections and even existing Apple connecting cables may not work even with the addition of the £25 Lightning adapter to connect to your shiny new Apple device. This is because it looks like the new Apple connection doesn't output an analogue signal, so any kit that takes an analogue audio signal – and that's most of them – wouldn't work. On the Apple website it clearly states on the Lightning to 30-Pin adapter page, "video and iPod Out not supported", and that "some 30-pin accessories are not supported". Sources close to Apple have told us that it should work fine with existing Apple docks but we're struggling to confirm the details. While other sites, such as the Cypher Labs blog, seem adamant the Lightning connection won't output analogue audio. Meanwhile other sources within the Apple accessory industry seem more convinced that ultimately Apple wants people connecting wirelessly via AirPlay and that the dock as a music solution looks to be on the way out longer term. Certainly it's clearly not up for debate that video output won't work through the adapter, which will be a shame for anyone who wanted to see video from their iPhone or new iPod touch or iPod nano on a screen through a USB connection. One solution, being suggested by the 148apps site, is that this Lightning to 30-Pin adapter has a built-in DAC, which can convert the digital signal to analogue before it reaches your kit. But for £25, that would be pretty good value for a tiny DAC. And Apple certainly did not make that clear. We know that many Apple accessory manufacturers are looking in to this now, and will report back as soon as we hear more news. Naturally, we've asked Apple's PR team, too.